Everyone’s faces after ep 28. Good things never last on Hotel King. I’m talking about what happens in the show and also the show itself. After last week’s rather thrilling episode, the show quickly reverted back to its ridiculous and eye rolls-inducing ways. All the good will that the show won with its last episode was lost in a matter of minutes. While Hotel King has always been an over-the-top melodrama, the crazy level has been raised even more…if that was even possible. We’re one evil twin away from this show being a straight-up soap opera that could rival the craziest telenovelas. Hey, there are still three episodes left. That’s plenty of time for an evil twin to appear. Mo-ne and Woo-hyun arrive at the abandoned building where an unconscious Jae-wan and injured Chairwoman Baek were last seen. As the building exploded with fireballs flying out in all directions, the fate of them two were unknown. One can only surmise that they’re dead because it seems kind of difficult to survive an exploding building. A quick jump in time shows Jae-wan sitting by the bedside of a comatose Chairwoman Baek in the hospital. It appears that Jae-wan is going to be just fine, despite being close to death in the last episode after being beaten by Joong-goo’s men. How he survived being viciously hit with a cinder block to the head baffles me. Besides the large bandage wrapped around his head and a nasty cut on his cheek, Jae-wan doesn’t look that much worse for wear. Chairwoman Baek, on the other hand, has already been in a coma for a week, even though she did not seem to be very injured at the building. Did they switch injuries or something? What happened in that building?! The ever concerned Joong-goo calls Jae-wan at the hospital to remind him that he shouldn’t be mad at him since he was the one who rescued him and Chairwoman Baek out of the building before the explosion occurred, after all. Oh, so Joong-goo saved them. And that’s all the explanation we’re going to get on how they survived. Jae-wan obviously goes ballistic listening to Joong-goo, and vows to make him pay for what he’s done. 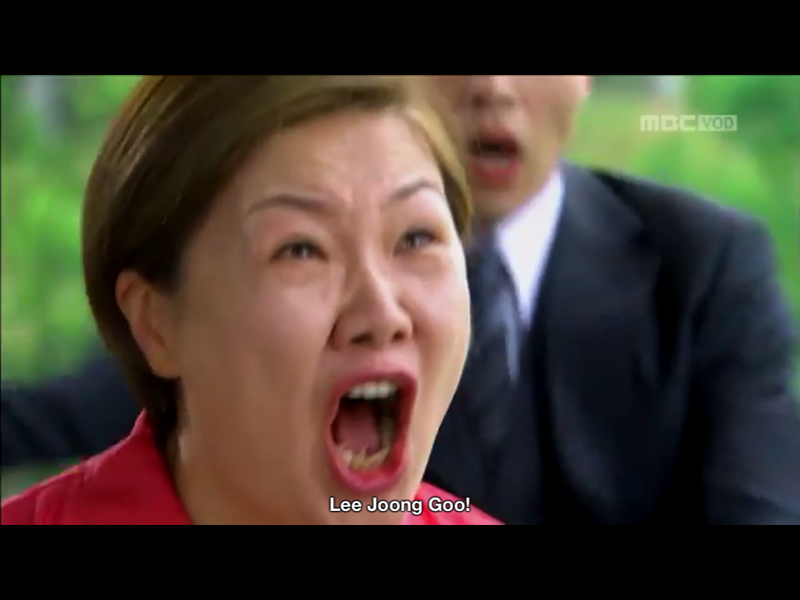 Joong-goo responds with the creepiest maniacal laughter ever. Chae-kyung comes to the hospital to see Jae-wan, not to ask after his injuries but to tell him that he needs to get back to work at Ciel. Without him there, there’s no one in charge at the hotel anymore. Mo-ne comes into the room to see Chae-kyung lecturing Jae-wan on abandoning the hotel at such a critical time, so Mo-ne then yells at her for saying that to him. Chae-kyung calls Mo-ne out for being a weak girlfriend who only knows to follow him around instead of doing anything helpful. Oh snap, mic drop. Preach, Chae-kyung, preach. Chairwoman Baek wakes up from her coma, but the “emotional trauma” from being held captive by Joong-goo and the explosion has caused her mentality to be that of a 5-year-old. She doesn’t recognize Jae-wan or Mo-ne when they come to see her. The doctors are unsure of when Chairwoman Baek will recover from this state of mind. In the meantime, they urge Mo-ne and Jae-wan to accept her current identity as a 5-year-old to prevent agitating her mental state any further. They bring her back to Jae-wan’s house after they’re discharged from the hospital. Chairwoman Baek quickly takes a liking to Mo-ne, playing hide-and-seek with her, while being scared and nervous of Jae-wan. Even though his mom doesn’t know who he is, Jae-wan is nevertheless happy to see Chairwoman Baek act so carefree and have fun, especially compared to how much anger she previously held inside. Mo-ne gets the parental approval. Jae-wan and Mo-ne go back to work at Ciel, and leave Chairwoman Baek at Jae-wan’s house. Having played hide-and-seek with Mo-ne before, Chairwoman Baek asks her caretaker to play with her as well. During the game, she accidentally sees a Ciel maid outside of the house, and mistaking her for Mo-ne wanting to play with her, she follows her back to the hotel. Chairwoman Baek eventually finds Mo-ne at the hotel, but thinks that she’s still playing the game with her. When Mo-ne receives a call from the caretaker that Chairwoman Baek is missing, she runs to find Jae-wan. Chairwoman Baek sees her running away and thinks that she’s trying to look for her, so she goes into one of the guest rooms and hides in the closet. Jae-wan receives Mo-ne’s call about Chairwoman Baek’s disappearance while he’s meeting with the hotel team leaders and Woo-hyun to discuss reinstating Mo-ne as the Chairwoman of Ciel. Meanwhile, a couple just checked into the hotel room and finds Chairwoman Baek hiding in the closet. Outraged, they phone the front desk, complaining that someone was hiding in their room. Mo-ne and Jae-wan hear this and know that it’s Chairwoman Baek that he’s talking about. They burst into the hotel room right as the male guest is yelling and threatening to hit Chairwoman Baek for being in their room and not apologizing. Mo-ne tries to protect her and yell back at the man, but Jae-wan cuts her off and gets on his knees to apologize to the couple. He explains to them that his mom isn’t crazy, but is just very sick and doesn’t know what she’s doing. After escorting Chairwoman Baek out of Ciel, Jae-wan takes her out to spend the day together. Eventually, she relaxes around Jae-wan and isn’t scared of him anymore. She says it’s because he was willing to apologize for her to that scary man before. Jae-wan is absolutely thrilled to be able to have a loving relationship with his mom again, despite her mentality at the moment. They walk home, hand-in-hand. Mo-ne is back at Jae-wan’s house to help out with taking care of his mom, and she’s just always there anyways. As she’s helping Chairwoman Baek take a bath, she teaches her to say to Jae-wan to marry her, Mo-ne. She thinks that because his mom is the one saying it to him, he will be more likely to agree. Sure, if you say so, Mo-ne. When it comes time for Chairwoman Baek to say it to Jae-wan, she messes it up and tells him to marry her instead of Mo-ne. Jae-wan plays along by agreeing, and Mo-ne and Chairwoman Baek pretend to fight over him. Cute stuff. Mo-ne and Jae-wan later discuss in the garden about why she wants to marry him. Mo-ne admits that she wants to marry him out of her own greed and selfishness. Not shocking, at all. She tells him that after losing her own mother at a young age and spending so little time with her father while growing up, she wishes to be in a real family with Chairwoman Baek and Jae-wan. Jae-wan agrees that they should get married, and lays on the charm by saying, “Let’s do it.” So. Romantic. She ain’t digging this proposal. Mo-ne is happy that he’s agreeing to them getting married. She thinks that it’s all settled then, but hold up, not so fast. Jae-wan remedies his, “Let’s do it,” proposal by doing it the right way. He gets down on one knee and presents her with a diamond ring. He tells Mo-ne that he actually bought it awhile ago, imagining that he might be able to do this someday. Mo-ne obviously agrees to his proposal. They agree to get married one year from this day because he wants to help her become Chairwoman of Ciel first. Meh. That’s the proposal scene summed up in one word. Joong-goo strolls into Ciel the next day, much to the surprise of everyone. When Jae-wan sees him chilling in the lobby, he obviously loses his mind. He tells the front desk that Joong-goo is banned from the hotel, and grabs him by his collar that he warned him that he’d kill him if he ever showed his face again. Joong-goo, being the jackass that he is, asks about Chairwoman Baek, enraging Jae-wan even more. At this very moment, Jae-wan is called to the “inspection room” of Ciel. Return of the crazy eyes. In the “inspection room,” the head of Ciel’s legal dept/security/police/whatever is interrogating Jae-wan on his connections to all the problems that have recently happened at Ciel. They try to tie him to leaking out information about the VIP guests, the failure of the Yoo Joo-min concert and its exploding sound equipment, offering bribes, and everything else that has happened. Jae-wan denies being responsible for any of the things they are accusing him of. The guy interrogating him says they have proof now that he’s responsible for plotting against Ciel, and shows up a surveillance picture of Chairwoman Baek, Joong-goo and Lay Kim (remember him?!) at Joong-goo’s house at this very moment. Upon seeing this, Jae-wan runs like a madman outta there towards Joong-goo’s house. Lay Kim has been working with Joong-goo all this time to take over Ciel. Joong-goo probably promised to give him some shares or something if he helps him. Hearing about Chairwoman Baek’s current condition, Lay Kim goes to Jae-wan’s house and convinces her to leave with him. At Joong-goo’s house, the two jackasses try to confirm her mental state, with Joong-goo giggling when he sees the way she is now. Ew, he’s so gross. Jae-wan arrives at Joong-goo’s place to see him asking Chairwoman Baek if she recognizes him. She stares at him, and suddenly starts screaming, “Lee Joong-goo” over and over again until she faints into Jae-wan’s arms. The only right way to greet Joong-goo. Does Chairwoman Baek have her mental state restored or does she just recognize Joong-goo out of pure hatred? Kind of hard to forget the face of the man you’ve been plotting to destroy for the past 33 years. After the incident with Chairwoman Baek hiding in the hotel room’s closet, Mo-ne lets Jae-wan and his mom spend the day together, but goes back to his house that night. Driving her there is none other than certified nice guy, Woo-hyun. He even tells Mo-ne that he’s willing to just be her friend now. So, he basically put up no fight at all for her during this entire series. Roman calls Jae-wan to joke about how he’s hurt that neither he nor his mom has called him or left him a message since he’s been back in America. It’s only then does Jae-wan tell Roman about what happened with Chairwoman Baek. He didn’t tell Roman immediately after all that stuff happened?! Did he forget that she’s also his mom? Poor Roman; no wonder he was so afraid of Jae-wan stealing Chairwoman Baek from him. Pay your phone bills on time, Jae-wan.